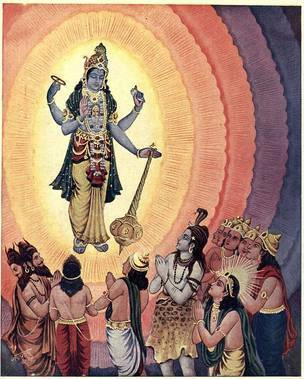 Three avathArikais were mentioned for this pAsuram [by nanjIyar]. The first avathArikai is that AzhwAr is moving away from emperumAn citing his unsuitability since he is trying to attain a means [emperumAn] who is attainable only by the thirty three dhEvas who are great in terms of knowledge, power etc. The second avathArikai relates to AzhwAr saying disgustedly to his heart “emperumAn will be attained only by dhEvas who are interested in other benefits and not by us who are totally desirous of only him”. The third avathArikai is about AzhwAr telling his heart in a dejected manner “emperumAn will be attained only by dhEvas who hold on to other means but not by us who hold on to only him as the means”. nAm Ar – in what classification do we belong? vaNakkam Ar – to which type will the attainment that we [people with lowly power] make, belong? E pAvam – how are (our) sins? allAl – apart from these [33 entities] who are full of knowledge and power. thirumARku nAm Ar vaNakkam Ar – do we have the qualification to attain the consort of SrI mahAlakshmi? Couldn’t only great people attain him? Is our salutation etc, of any significance for him? E pAvam – The reason for our losing him when he is at such close proximity is our sin only. One interpretation here is that we had to lose out on emperumAn since we went away from emperumAn considering our unsuitability. The second interpretation is that the reason for losing emperumAn and not enjoying him despite our heart seeing him is due to our sin [here, the term ‘our’ refers to AzhwAr]. nannenjE – On my good heart who remains with me irrespective of whether I attain emperumAn or lose out on him. nAm miga nAzh udaiyOm – As mentioned in the decad “vaLavEzh ulagum” (thiruvAimozhi 1-5) , if we consider the unsuitability interpretation, it would mean “do we, the epitome of faults, have the qualification to approach the consort of SrI mahAlakshmi? Isn’t moving away from him the proper course of action? Isn’t it due to our ignorance that we approached him despite our lowliness?” If we consider the second interpretation (losing him out due to our sin), it would mean “emperumAn who carries out activities for those who have other means [to attain him] and who seek other benefits, would consider us, who have no other means and who seek no other benefit, as having sins”. The long syllable A in nAmA is indicative of the element of surprise. We will move on to the 11th pAsuram next. This entry was posted in iyaRpA, periya thiruvandhAdhi on October 16, 2018 by T N Krishnan.